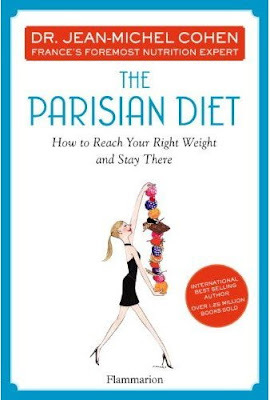 Dr. Jean-Michel Cohen's The Parisian Diet: How to Reach Your Right Weight and Stay There is my last diet book review for at least a few weeks and for me it was something of an enigma. I truly enjoyed reading much of Dr. Cohen's diet's preamble. He preaches mindful eating of 3 meals a day with 20 mins allotted to each (just for the eating part), and at least on paper, he talks about how overly restrictive diets are part and parcel of long term diet failure. D. What is your current weight. For eg. Age 18=180lbs. Highest ever=243lbs. Lightest after extreme dieting at 32= 147lbs. Current weight=243lbs. "Right weight"=203.25lbs. Dr. Cohen's recommendation is to use his plan to reach your "Right" weight, then to stay at that weight for 6 months and then to re-calculate your new "Right" weight and continue to repeat this process until your BMI is in the "normal" range. "continue eating 5 low calorie meals a week. There is no other way to maintain your weight loss"
The book's nutritional recommendations seem fairly solid. A big more saturated fat phobic than perhaps the literature would warrant, same with eggs, but those quibbles aside, the food involved seems healthful. So what of the dieting part? This is where I became rather confused. Despite alluding to the fact that overly restrictive diets are part and parcel of long term failure his diet starts with an exceedingly restrictive, albeit optional diet phase. It's called the Cafe phase and it's 10 days long with promise of you losing up to a lb a day. Dr. Cohen warns you not to do it if you're not in "good health" and that you need to take a multivitamin as you won't be eating enough to meet your nutritional needs through food. Ok, so the Cafe phase we're warned is highly restrictive so perhaps not a huge surprise that when I crunched numbers I came up with a minuscule 719 calories a day. That's an incredibly small number. In fact it's a small enough number of calories that many would suggest it should only be undertaken under an MD's supervision (who would be monitoring for hypokalemia and/or adjusting medications as needed). "you should take multivitamin and magnesium supplements to avoid fatigue and cramps and drink plenty of liquids throughout the day". So how many calories did I calculate for a Bistro phase day? 753. Again, an almost insanely small number and not without albeit distant but potential risk. "designed for pure enjoyment and consists of delicious menus that make it easy to stay on course long term"
So how many calories make up a day designed for "pure enjoyment"? 1,080 if Day 1 is a measure. Honestly I really enjoyed Dr. Cohen's writing and I had great difficulty reconciling the reasonable and thoughtful preamble to his dieting recommendations with his actual dieting recommendations. If you plan on picking up this plan from my perspective the calories are simply too low. An easy fix for women might be to double the recipes and recommendations of the first two phases and increase them by 50% in the Gourmet phase. No doubt you'll lose less weight and more slowly, but at least you'll stand a chance at enjoying life through food some. For men, I'd nearly triple the recommendations for the Cafe and Bistro phases and double the Gourmet. Again expect lesser, slower loss, but a life you might actually sustain.